Former (and future?) Flyer James van Riemsdyk. Free agents aren't yet permitted to sign with NHL teams, but that didn't stop the Philadelphia Flyers from making an early splash on Saturday night. 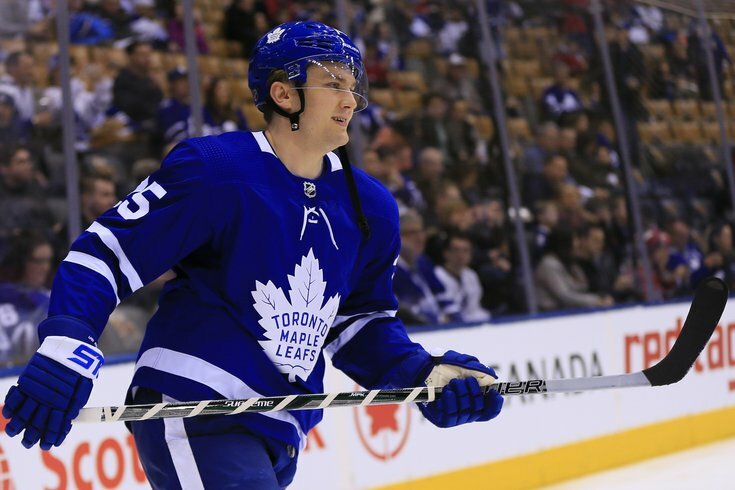 According to several reports, the Flyers will sign a familiar face to a multi-year deal when NHL free agency opens on Sunday afternoon: left winger James van Riemsdyk. UPDATE: The Flyers made the signing official on Sunday afternoon. It is for five years and will reportedly come with an annual cap hit of $7 million. TSN's Frank Seravalli was first to report the news. Van Riemsdyk, a 29-year-old Middletown, New Jersey native, was originally selected by the Flyers with the second-overall pick in the 2007 NHL Draft and spent three seasons in orange and black, recording 99 points (47 goals, 52 assists) in 196 games with the Orange and Black (0.51 PPG). Then, in June 2012, JVR was traded to the Maple Leafs for Luke Schenn. In six seasons with Toronto, he scored 154 goals and notched 140 assists in 413 games (0.71 PPG), including 54 points last season. Now, he returns to the team that drafted him — and it appears it's not for a short stint either. According to ESPN's John Bucigross, the deal is worth $35 million over five seasons ($7 million/year cap hit). Is this the big move Ron Hextall alluded to on Friday? Perhaps, although they still have some cap space (about $14 million of it) to play with.